These iconic falls are beautiful enough to have garnered comparisons to the garden of Eden, inspiring America’s first artist colony and putting the Catskills on the map as one of the country’s oldest tourist destinations. Enormous one time fiber mill now houses local artists and small businesses. In the early 1800’s New York’s Catskill mountains were still widely considered a fearful and savage place, but as the frontier shifted west following the War of 1812 visitors were increasingly drawn to the natural beauty of the area. While Kaaterskill Falls had already been the subject of other romanticized writing, it was Washington Irving’s depiction of the cascading water in his 1819 novel Rip Van Winkle that really began to lure other artists to the area. Thomas Cole was inspired to take his first trip to the waterfall in 1825 and with his subsequent paintings Kaaterskill Falls were lauded as the wilderness ideal for landscape art. The Hudson River School of art followed, and America’s first generation of artists developed an aesthetic heavily influenced by the scenic beauty of the surrounding area. By the mid-19th century Kaaterskill Falls and numerous works of art depicting their grandeur made the eastern Catskills a top destination for vacationers from around the world. In their prime, the Kaaterskills were such a tourist magnet that a dam was erected at the crest to regulate the flow of the water in scheduled “performances” at which spectators were charged an admission fee to witness the falls in action. 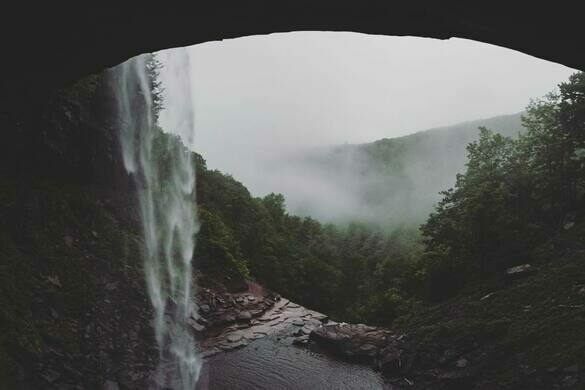 Today Kaaterskill Falls are back to flowing of their own accord, attracting campers and day-hikers with their still iconic beauty. With 260 feet of cascading water divided into two segments by a large, clear pool, the falls are quite the dramatic sight to behold. Remnants of their heyday can be found in the crumbling foundations of long-deceased luxury hotels in the nearby woods, and a strange little plaque halfway up the top tier of the waterfall adds a ghostly element to the area’s mystique. An engraving dated June of 1868 commemorates Vite, “the Bayard of Dogs”, who fell to his doggie death when he jumped from the top of the falls in an attempt to reach his beloved master at the bottom. Humans have also lost their lives climbing the slippery falls, even in recent years, but Vite’s tale of reckless devotion and the bond held between man and animal seems to have struck a lingering chord. Supposedly the canine spirit still haunts the falls, particularly on June 19th, the anniversary of his death. 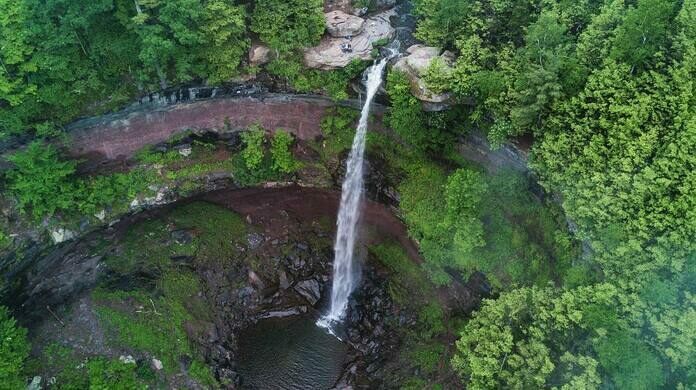 Local legend claims that one can hear ghostly barks and howls and maybe even catch a glimpse of a furry apparition flying through the air as Vite repeats his fatal leap from the top of Kaaterskill Falls to the precipice down below.